Canby Grove is lighting up the Christmas season with a fun filled festival of lights, music and activities for the whole family! A campfire in the center of our grounds will be burning all evening. Gather around to meet new friends or roast some marshmallows. S'mores Packs will be available for purchase or bring your own and cook them over an open fire. All evening the grounds will be filled with the sounds of Christmas music. Acoustic artists will warm up the Fireside Room. Canby’s own Cantalinas Choir and College Kids Variety Show will fill the main stage with the spirit of Christmas. Street carolers will make the campfire merry and featured country music artist Aaron Crawford will rock the Big Red Barn until closing. Aaron and his band are based out of Seattle and are widely recognized as one of the premier country music bands in the northwest. You don't want to miss this! Fun for the whole family. Kids Christmas movies will be shown in the Evergreen Room. Popcorn will be served, cookies will be available for frosting and an artist will be creating balloon masterpieces. Christmas crafts are planned for the whole family and will be available from 5pm to 8pm in the Big Red Barn while supplies last. Create a Christmas booklet and personalize it for family and friends (Perfect for gift card giving), try your hand at wood burning or several simple crafts for young elves. Be one of the first 25 adults to have the opportunity to work with designer Lori Mayo, in creating your own centerpiece with greenery fresh-cut from the grounds at The Grove (A great addition to your holiday festivities). A chance to win prizes that last year included Portland Timbers Tickets, gift cards to Wild Hare Saloon, Oswego Grill, Tai Corner The Backstop and Roxies, Tai Kwon Do Lessons, Tanning Packages, Papa Murphy’s pizzas, one week of summer camp and much more. 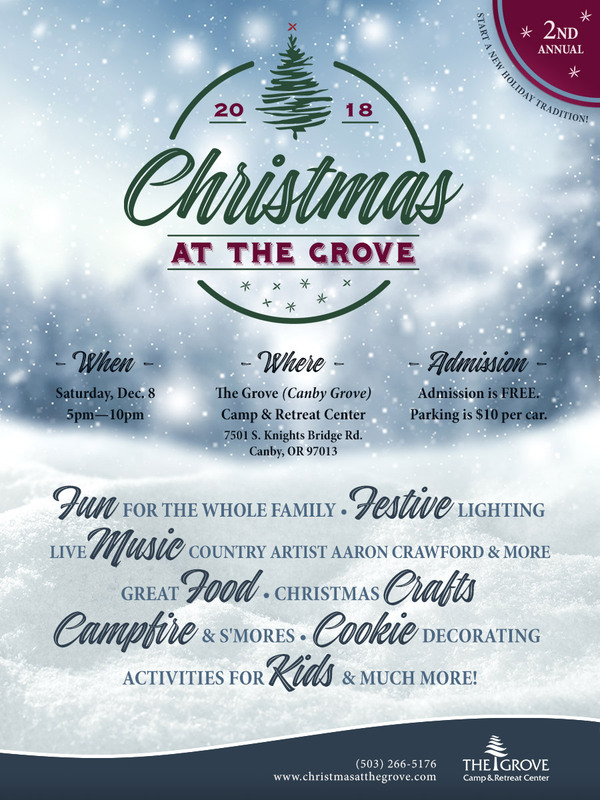 Christmas at the Grove is a great way to start off your Christmas season! So come on out and bring your family and friends. It’s sure to become an annual Christmas tradition!